Plants Vs. Zombies: Garden Warfare, the Microsoft-exclusive third-person shooter, won't have microtransactions when it launches next week. Plants Vs. Zombies: Garden Warfare is an upcoming third-person shooter spin-off of the immensely popular Plants Vs. Zombies tower-defense franchise, and it launches next week exclusively for Xbox One and 360. In an effort to quell concerns over Plants Vs. Zombies 2's heavy use of microtransactions, PopCap Games producer Brian Lindley assured GameSpot that the shooter spin-off won't have any microtransactions - at least not at launch. "So we're not going to have any microtransactions at all at launch," said Lindley, which doesn't rule out the possibility of them working their way into the game later on. He also discussed the game's resolution, stating that "The Xbox One outputs in 1080p," but was unable to confirm whether the game would be 1080p native or upscaled. Also, while PvZ: GW may be a Microsoft exclusive for now, Lindley gave Sony fans a little hope when he said that "We have nothing to announce at this point, but I always caveat that with the comment that we want to get this game in the hands of as many people as possible." Finally, Lindley assured us that another SimCity-type server fiasco is not something we have to worry about with this game, as "We've tested extensively; a lot of stress testing and...make sure everything is buttoned up and ready for launch as much as possible." 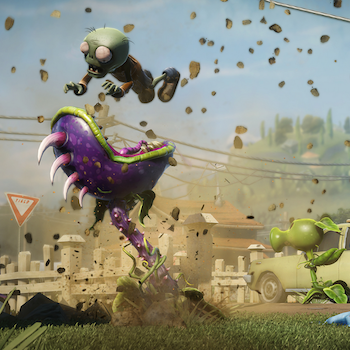 Plants Vs. Zombies: Garden Warfare launches February 25 for Xbox One and Xbox 360, with a Windows PC version planned some time in the future. It is powered by the same FrostBite 3 engine that is behind DICE's Battlefield 4.